Description: The whole colony has a stiff, bushy appearance.The main stems of this species are robust and have only a few strong side branches which arise irregularly at an angle of 30 degrees and in 3-dimensions. The main and side branches have finer tertiary branches which support the polyps on short stems. The main stem and secondary branches are usually a distinctive yellow colour. The reproductive gonothecae are quite characteristic, being ovate in shape and with rows of spinous outgrowths. This species is winter fertile, reproductive structures are not found during the summer months. Colonies typically 80-130mm in height. Habitat: Usually found in sites that are exposed to tidal streams and/or wave action. It often grows on steep or vertical bedrock, and also on the sides of gullies. 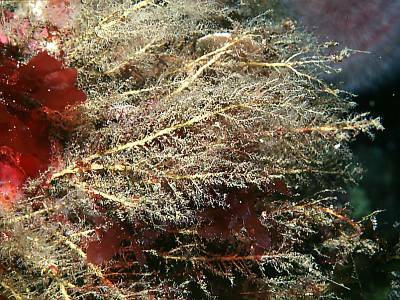 Ecology: The nudibranch Cuthona pustulata feeds exclusively on this hydroid. Distribution: A northern species in the British Isles, it is more common on the western coasts of Scotland than in south west Britain, where it is confined to the most exposed sites. Occurs at least as far south as Lundy Island in the Bristol Channel and Skomer Island, Pembrokeshire. Similar Species: This species is more robust and irregularly branched than Halecium halecinum. Irregular branching of straight main stems in 3-dimensions. Yellow coloration of main stems. The gonothecae are ovate in shape with spiny projections. Picton, B.E. & Morrow, C.C. (2016). Halecium muricatum (Ellis & Solander, 1786). [In] Encyclopedia of Marine Life of Britain and Ireland.